Are these resources really free? Is there a Third Millennium mobile app? Attach an asterisk (*) to the end of a word as a wildcard. Attach a tilde (~) to the front of a word to omit results containing that word. Instructor: Dr. Richard L. Pratt, Jr. If you were a king, an absolute monarch, how would you rule your kingdom? How would you manage the growth and the setbacks of your reign? How would you handle enemies and friends outside of your empire and how would you deal with traitors and faithful servants within your kingdom? These are good questions to ask ourselves as we study the Old Testament. After all, the Old Testament presents God as the divine king who is building and expanding his kingdom to the ends of the earth. His kingdom has a long history of advances and setbacks. There have been both enemies and friends outside of God's kingdom, and there have been traitors and faithful servants within his kingdom. So, how did God decide to rule over his kingdom? How does he regulate life within his kingdom? The Bible's answer is this — God administered his kingdom through covenants. 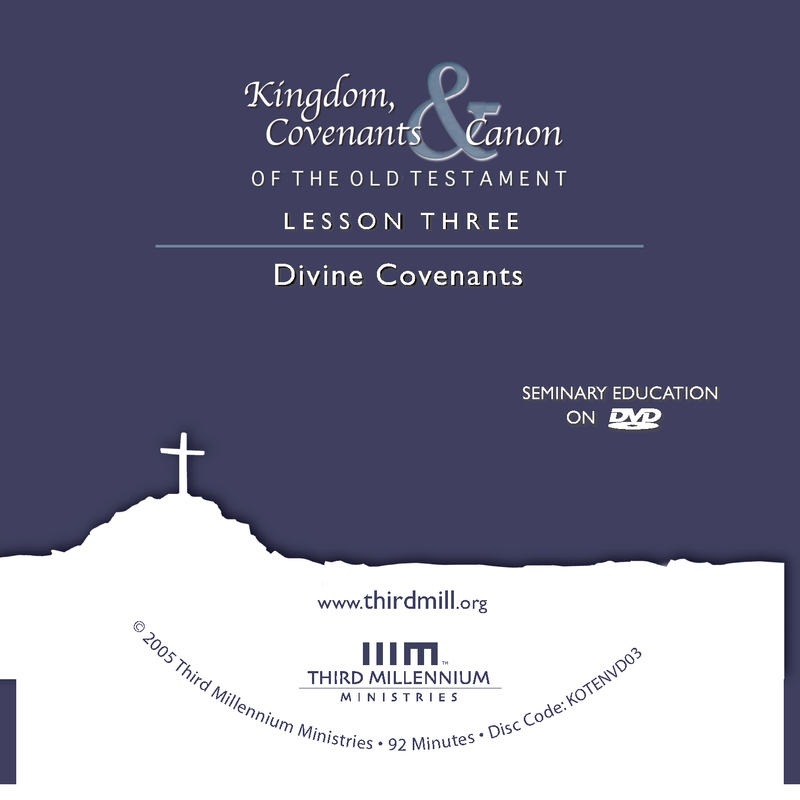 This is the third lesson in our series, Kingdom, Covenants and Canon of the Old Testament. In this survey of the Old Testament we will see that the Old Testament is a book about the kingdom of God, a kingdom that God administered through covenants, which in turn were explained and applied to God's people in the books or "canon" of the Old Testament. We have entitled this lesson "Divine Covenants" because we will be exploring how God governed his kingdom through a series of covenants that he established in Old Testament history. As we grasp the contours of these covenants, we will see more clearly how divine covenants guided the life of God's people in the Old Testament, and we will also see more clearly how they guide our lives even today. Our exploration of divine covenants will divide into four parts. First, we will investigate the fundamental relationship between God's kingdom and his covenants. Second, we will look into the historical developments of covenants in the Old Testament. Third, we will examine the dynamics of life in covenant with God. And fourth, we will explore the people of the divine covenants. Let's turn first to the connection between God's kingdom and his covenants. In our last lesson we touched on the fact that the entire Old Testament is unified by the theme of God's kingdom coming to earth as it is in heaven. In this lesson we will see that the concept of "covenant" is very close to the heart of Old Testament faith as well. The importance of covenants in the Old Testament is evident in many ways, including the fact that the term usually translated "covenant," berit in Hebrew, appears some 287 times. The prominence of the term "covenant" in this book about God's kingdom raises an important question: How did divine covenants relate to the kingdom of God? What is the association between these two very central biblical concepts? To answer these questions we will look at two issues. First, we will introduce some recent archaeological discoveries that provide a background for understanding the fundamental nature of biblical covenants. And second, we will see how these discoveries give us insights into the biblical connection between God's kingdom and his covenants. Let's begin simply by describing some recent archaeological discoveries that are relevant for our study of biblical covenants. One of the most remarkable things about the Old Testament is that it is not a fairy tale. The events we find described there actually took place in space and time, in the ancient world of the Middle East. One of the most exciting things about studying the Old Testament in our day is the fact that we have the privilege of knowing much more about that ancient world of the Bible through recent archaeology. We know much more than Christians have known in the past, and as a result, we often find that our understanding of the Old Testament is enhanced by this background knowledge. This is certainly true when it comes to understanding covenants in the Old Testament. In the last century, many discoveries were made about the cultures surrounding ancient Israel that have given us many insights into the character of biblical covenants. Many different ancient writings help us understand covenants more thoroughly, but for our purposes, one of the most important discoveries is a group of writings known as suzerain-vassal treaties. Now, don't let this terminology throw you. The term "suzerain" comes from the same root as the Latin word Caesar, Czar in Russian, or Kaiser in German. It simply means "emperor." And of course, the term "vassal" means "servant," or in this case "servant of the emperor." A suzerain-vassal treaty was an international agreement made between a great emperor (or suzerain) on the one hand, and a lesser king and nation, on the other hand. Within these treaties, the lesser king and nation served as the vassals of the great emperor. The ancient world of the Bible was a world of empires, and in many ways, this political reality so dominated the landscape of the Ancient Near East that it shaped the ways people thought about nearly everything in life. This was certainly true with respect to the ways empires were established, maintained, and administered. In the ancient world, great kings such as the Pharaohs of Egypt, the powerful kings of the Hittites, or the Assyrian Emperors would extend their kingdoms by conquering or annexing weaker nations and city-states. Of course, not every international relationship was handled in exactly the same way, but many of them were formalized and managed through what we now call suzerain-vassal treaties. Suzerain-vassal treaties are important to Old Testament studies for many reasons, but we are particularly concerned with one main idea: suzerain-vassal treaties were designed by kings for the administration of their kingdoms. Now to get a flavor of what these imperial arrangements were like, it will help to describe the contents of typical suzerain-vassal treaties. With rare exceptions, the formal features of these ancient treaties followed a predictable threefold pattern. First, the treaties were introduced by a focus on royal benevolence, the kindnesses the emperor had shown to his vassals. They began with a preamble in which the king identified himself as a glorious king, worthy of praise. And at certain stages in history, the preamble was followed by a historical prologue in which the king described many good things that he had done for the people. The second major portion of suzerain-vassal treaties focused on the requirement of vassal loyalty. They spelled out the kinds of obedience required of the emperor's vassals. Lists of rules and regulations were given to explain how vassals were expected to live in the suzerain's kingdom. The third major portion of suzerain-vassal treaties drew attention to the consequences of loyalty and disloyalty from the vassals. Faithful servants were promised further blessings or rewards, but unfaithful servants were threatened with curses or punishments of various sorts from their emperors. Now, other elements also appear in these treaties. For instance, provision was made for the safekeeping of treaty documents, and divine witnesses were called to watch over the parties of the treaties so that the terms of these treaties would not be forgotten. But the heart of the suzerain-vassal relationship may be put in this way. Great kings declared their benevolence toward lesser vassal kings and nations. The suzerains required loyal service from their vassals because they had shown kindness. And they set forth many positive and negative consequences for the loyalty and disloyalty of their vassals. As we will see, these three central features of suzerain-vassal treaties will help us understand more clearly the nature of Old Testament covenants and how they relate to the kingdom of God. With the basic concept of suzerain-vassal treaties in mind, we are in a position to see what insights they offer us as we explore the connections between covenants and kingdom. Now we should say from the outset that in a broad sense the term covenant (or berit) describes many different kinds of relationships. It points to relationships between friends, spouses, political leaders, tribes and nations. All of these relationships were called covenants in the Old Testament because they formally bound people to each other with mutual obligations and expectations. But these relationships were so diverse that their covenants differed in many ways. And more than this, the Scriptures sometimes compare these diverse covenant relationships to God's relationship with his people. For instance, our relation with God is described as marriage, as a family bond, and as friendship. So, we can learn much about ourselves and God from these different types of covenants. But our concern in this lesson is not with this broad range of analogies, but with one specific type of covenant in the Old Testament, namely divine covenants. These are the covenants that God himself made with people. God made six such major corporate covenants in the Old Testament. He entered into covenants with Adam, Noah, Abraham, Moses, David and Christ. In this lesson we are primarily interested in understanding the character of these covenants and how they relate to the kingdom of God. Now, we will explore all six divine covenants in this lesson. But at this point, we will look briefly at one of these covenants, the covenant with Moses, to illustrate how suzerain-vassal treaties have helped us understand the character of Old Testament covenants. The covenant with Moses is particularly well suited for our purposes because God revealed so much more about this covenant than he did about any others in the Old Testament. When we look at the covenant God made with Moses, it quickly becomes apparent that it was structured in ways that resemble Ancient Near Eastern suzerain-vassal treaties. Moses' covenant consisted of the same three main elements that we have seen in these treaties. And this resemblance will help us understand that in a fundamental sense, God's covenants were the way he, as the great king of Israel, chose to administer his kingdom. You yourselves have seen what I did to Egypt, and how I carried you on eagles' wings and brought you to myself. Now if you obey me fully and keep my covenant, then out of all nations you will be my treasured possession. Although the whole earth is mine, you will be for me a kingdom of priests and a holy nation (Exodus 19:4-6). These verses open the scene where God entered into covenant with Israel when the nation gathered at the foot of Mount Sinai on their way to the Promised Land, and they closely reflect the three central elements of a suzerain-vassal treaty. You'll recall that suzerain-vassal treaties had three main concerns: the presentation of royal benevolence, the requirement of vassal loyalty, and the consequences of loyalty and disloyalty. And interestingly enough, these same three concerns appear in Moses' covenant as it was introduced in Exodus 19:4-6. You yourselves have seen what I did to Egypt, and how I carried you on eagles' wings and brought you to myself (Exodus 19:4). their kind king; he had done great things in delivering Israel from Egypt, and it was in the context of his benevolence toward his people that he offered to enter into covenant with them. Now if you obey me fully and keep my covenant, then out of all nations you will be my treasured possession (Exodus 19:5). Like Ancient Near Eastern suzerains, God required loyalty from his human vassals. Although Moses' covenant was based on God's mercy and not human good works, God still required his servants to be loyal, and Moses' law spelled out many of the ways they were to show their loyalty. The people were expected to obey the regulations of the covenant. Now if you obey me fully and keep my covenant, then out of all nations you will be my treasured possession. Although the whole earth is mine, you will be for me a kingdom of priests and a holy nation (Exodus 19:5-6). Like Ancient Near Eastern emperors, God made it clear that if the people were faithful, they would receive great blessings — they would be a treasured possession, a kingdom of priests. And by implication, if they were unfaithful, they would not receive these great blessings but would be cursed instead. So, we see that the threefold pattern of suzerain-vassal treaties appears in God's covenant with Moses. As suzerains claimed to be kind to their vassals, when God entered into covenant with Israel, he first established his divine benevolence toward them. The covenant went on to set forth the expectations of human loyalty to God, and the covenant specified the consequences of blessings and curses that the people could expect as they were loyal or disloyal to God. The fact that the Mosaic covenant reflected these elements of suzerain-vassal treaties demonstrates that at a very basic level, when God made covenant with his people, he revealed himself to Israel as their great king, their emperor, and that he wanted his people to think of themselves as his vassals. Old Testament divine covenants were essentially royal arrangements. Kingdom and covenants go hand in hand because covenants were the means by which God ruled over his kingdom. They were God's kingdom administrations leading the kingdom of God toward its destiny of expanding to the ends of the earth. Now that we have seen that divine covenants had the fundamental function of regulating or administrating life in God's kingdom, we are in a position to look into our second topic: the historical developments of covenants in the Old Testament. As we have seen in a prior lesson, the history of the kingdom of God in the Old Testament was very complex. God's kingdom went through many different periods, or epochs, as it developed toward the goal of reaching the entire earth. At this point, we will see that during each period or stage in the kingdom, God introduced covenants that addressed the particular issues that people were facing at each stage of the kingdom. There are many ways we could handle the history of divine covenants in the Old Testament. But we will explore this history in three main stages: first, the universal covenants; second, the national covenants; and third, the New Covenant. As we have already mentioned, there are six major divine covenants that span the entire history of the Old Testament: God's covenants with Adam, Noah, Abraham, Moses, David and Christ. We will divide these six covenants into three groups aligned with the ways we described the historical stages of God's kingdom in the preceding lesson. We will speak of the universal covenants with Adam and Noah during the primeval history. We will speak of the national covenants with Abraham, Moses and David during the time when God drew close to the nation of Old Testament Israel as his special people. And we will speak of the new covenant in Christ during the New Testament phase of the kingdom. So, as we deal with the divine covenants, we will look into each of these three groups of covenants as they developed in the history of the Old Testament. Let's look first at the universal covenants that God established during the primeval history. We speak of the covenants with Adam and Noah as "universal" because they were made between God and all of humanity. During the primeval period, when these covenants were made, God had not yet identified Israel as his special people. Instead, Adam and Noah represented every person from every tribe and nation. And as a result, what happened to them impacted the lives of every human being to come after them. These universal covenants met the need for an administration of the kingdom during the primeval period. This was the time when God established the most basic arrangements that governed his relationship with the entire human race for all time. We'll investigate these universal covenants in chronological order, beginning with the covenant with Adam and then moving to Noah. Let's consider first God's covenant with Adam. As we all know, Adam was the first human being that God created, so when we speak of the covenant with Adam, we are referring to the earliest period of human history imaginable. And not surprisingly, we find the Bible's teaching about Adam's covenant focuses on some of the most basic or foundational dimensions of human life. The covenant with Adam appears in the creation narratives found in the first three chapters of Genesis. Now, we should mention that some Christians do not agree that God made a formal covenant with Adam. Most of these believers base their views on the fact that the term "covenant" does not appear in the first three chapters of Genesis, and some also argue that the basic contours of divine covenants cannot be found in these chapters. Nevertheless, three pieces of evidence strongly suggest that God did in fact establish a covenant with Adam as the representative of humanity. First, as we will see later in this lesson, the basic elements of divine covenants are indeed present in Genesis 1–3. Divine benevolence, human loyalty, and consequences for loyalty and disloyalty do appear in these chapters. Like Adam [or "humanity," as it may be translated], they have broken the covenant — they were unfaithful to me there (Hosea 6:7). This passage compares the sinfulness of Israel with Adam's sin in the Garden of Eden, and speaks of both as breaking covenant. Israel had broken covenant just like Adam had in the Garden of Eden. I will establish my covenant with you (Genesis 6:18). This passage is significant because the term translated "I will establish" does not normally mean "to start" or "to initiate" a covenant but "to confirm" a covenant that already exists. Noah's covenant was presented as a confirmation of a previously existing covenant, namely the covenant God made with Adam. Whether or not we call the divine arrangement with Adam a "covenant," it is clear that God entered a solemn relationship with Adam, and Adam represented the entire human race. The focus of this arrangement, or covenant with Adam, was to establish the most fundamental features of God's relationship with humanity, and for this reason, we may call it a covenant of foundations. In this covenant, God set the fundamental patterns of life for all human beings living in his world. Adam and Eve were ordained to serve as God's royal and priestly images, spreading his kingdom to the ends of the earth. They were tested and they failed. They suffered for their rebellion but were given hope. In short, the covenant with Adam laid out the parameters of humanity's relationship with God for all time. It established the foundations of our role in his kingdom. The second universal covenant is God's covenant with Noah. There is much that could be said about this covenant, but we will simply introduce some of the more central issues that come to the foreground in the biblical account. The covenant with Noah was also established in the primeval period of God's kingdom and concerned some of the most basic issues that face all of humanity. I will establish my covenant with you, and you will enter the ark — you and your sons and your wife and your sons' wives with you (Genesis 6:18). As we have already mentioned, Noah's covenant was not a brand new covenant, standing on its own. It was actually the establishment — that is, the furthering — of the covenant or arrangement God had made with Adam. I now establish my covenant with you and with your descendants after you and with … every living creature on earth… Never again will all life be cut off by the waters of a flood (Genesis 9:9-11). As we see here, God's covenant with Noah affected every living creature from that time on in some very important ways. Never again will I curse the ground because of man, even though every inclination of his heart is evil from childhood. And never again will I destroy all living creatures, as I have done. As long as the earth endures, seedtime and harvest, cold and heat, summer and winter, day and night will never cease (Genesis 8:21-22). In order to secure this strategy, God established his covenant with Noah, promising that nature would remain stable so that the human race could reach its destiny in this fallen world. This universal covenant, like the covenant with Adam, established basic structures for human existence that apply to all peoples in all places and at all times. Now that we have seen how God established the basic order of his kingdom and secured his kingdom purposes through the covenants with Adam and Noah, we should turn our attention to the period of the kingdom where Old Testament Israel moved to center stage. As the kingdom of God moved from the primeval history to the period in which God focused especially on the nation of Israel, God established three national covenants. We may rightly call these "national covenants" because they were especially concerned with Israel as the special chosen people of God. We will look at the national covenants in chronological order, beginning with the covenant with Abraham, then moving to Moses and finally David. On that day the Lord made a covenant with Abram (Genesis 15:18). I am God Almighty; walk before me and be blameless. I will confirm my covenant between me and you (Genesis 17:1-2). In this passage, God "confirmed" or "established" the covenant he had initiated with Abraham in Genesis 15. This is the same terminology that we saw in Genesis 6:18 when God confirmed with Noah the covenant that had been previously made with Adam. On that day the Lord made a covenant with Abram and said, "To your descendants I give this land" (Genesis 15:18). I will confirm my covenant between me and you and will greatly increase your numbers (Genesis 17:2). These covenant promises created a permanent vision for all of Israel's hopes as the people of God's kingdom. Remember your servants Abraham, Isaac and Israel, to whom you swore by your own self: "I will make your descendants as numerous as the stars in the sky and I will give your descendants all this land I promised them, and it will be their inheritance forever" (Exodus 32:13). The national covenant with Moses was not a brand new covenant that replaced the covenant with Abraham. Rather, it was built on and in harmony with the national covenant that God had previously made with Israel under Abraham. We find the primary record of God entering covenant with Israel through Moses in Exodus 19–24. As God gathered the twelve tribes at the foot of Mount Sinai, he was shaping them into a nation, a politically unified people. Although there had been rules and regulations for God's people before the time of Moses, like every new nation, one of the chief things Israel needed at this time was a system of law, a body of regulations to govern life in the nation. So God gave Israel the Ten Commandments and the Book of the Covenant to guide the nation. For this reason, the covenant with Moses may be called a covenant of law. So Moses … set before them all the words the Lord had commanded him to speak. The people all responded together, "We will do everything the Lord has said" (Exodus 19:7-8). So we see that the second covenant with the nation of Israel was the covenant with Moses, a covenant that stressed the law of God. Now we should turn to the covenant that came to Israel during the days of King David, when Israel had become a full-fledged empire. Now Lord, God of Israel, keep for your servant David my father the promises you made to him when you said, "You shall never fail to have a man to sit before me on the throne of Israel, if only your sons are careful in all they do to walk before me according to my law" (2 Chronicles 6:16). David's covenant was built on the previous covenants with the nation of Israel. I have made a covenant with my chosen one, I have sworn to David my servant, "I will establish your line forever and make your throne firm through all generations" (Psalm 89:3-4). This passage indicates that the David's covenant focused on kingship in Israel. Or to be more specific, it promised David that his line would always be Israel's ruling dynasty. When David became king over God's people, he blessed the nation by turning Israel into an empire; that is, he took them to a higher level of kingdom development. And to secure the future of this national blessing, God promised the stability of a permanent succession of kings, a dynasty. So we may call David's covenant Israel's covenant of kingship. Now that we have a basic understanding of the universal and national covenants, we should look at the covenant that governs the final stage of God's kingdom: the new covenant. In addition to the five covenants we have already seen, the prophets of the Old Testament spoke of a new covenant that would come during the final stage of God's kingdom. They announced that it would be greater than any covenant that had come before it. "The time is coming," declares the Lord, "when I will make a new covenant with the house of Israel and with the house of Judah" (Jeremiah 31:31). I will make a covenant of peace with them; it will be an everlasting covenant. I will establish them and increase their numbers, and I will put my sanctuary among them forever (Ezekiel 37:26). This cup is the new covenant in my blood; do this, whenever you drink it, in remembrance of me (1 Corinthians 11:25). Through this new covenant in Christ, God administers his kingdom in its final stage, which we call the New Testament age. The new covenant was designed to govern God's people during the time when God would complete the kingdom goals that he had established during the primeval period and furthered through the nation of Israel. And for this reason, it is best thought of as a covenant of fulfillment. "The time is coming," declares the Lord, "when I will make a new covenant with the house of Israel and with the house of Judah… I will put my law in their minds and write it on their hearts. I will be their God, and they will be my people. No longer will a man teach his neighbor, or a man his brother, saying, 'Know the Lord,' because they will all know me, from the least of them to the greatest," declares the Lord. "For I will forgive their wickedness and will remember their sins no more" (Jeremiah 31:31-34). As we saw in the preceding lesson, the arrival of this final stage of the kingdom of God comes in three phases. It was inaugurated through the earthly ministry of Christ and the work of his apostles. It continues in our time, and it will reach it fullness only when Christ returns at the consummation of all things. Remembering these three phases of the kingdom in the New Testament is essential to understanding how God established the new covenant. In a variety of ways, the effects of the new covenant also come in three phases. The transformations of the new covenant began to take effect at Christ's first coming. They continue throughout the entire history of the Christian church. But the ultimate reality of the new covenant will take place only when Christ returns. When that day comes, the new covenant will be the complete fulfillment of the entire history of God's covenants. It will bring to fruition God's purposes behind the covenant administrations in Adam, Noah, Abraham, Moses, and David. Having seen that covenants are the means by which God administers his kingdom throughout history, we should turn to our third topic: the dynamics of the covenants. How did each covenant govern the interactions between God and his people? Now before we can answer these questions, we need to make an important point. Some passages deal more directly with the moments when God formally entered into covenants or confirmed them, and these passages draw attention to the particular emphases of each covenant. But much more can be learned about the dynamics of covenant life that go far beyond these emphases. Adam's covenant stressed certain foundational patterns established at the commencement of the world. Noah's covenant emphasized the stability of nature. Abraham's covenant accentuated God's promise. Moses' covenant emphasized God's law. David's covenant highlighted the Davidic dynasty as God's specially chosen royal family. And the new covenant stressed fulfillment. But these emphases are not comprehensive descriptions of covenant life; they merely touch on certain highlights. To see a fuller picture of the dynamics of living in covenant we must recognize that life in covenant with God involved much more than these emphases. Adam's covenant relationship with God did not simply concern foundational matters. During the period of Noah, interaction between humanity and God involved much more than the stability of nature. Relationship with God during the period of Abraham entailed much more than promise. God administered the epoch of Moses with more in view than his law. God related to his people during the epoch of David in the light of more than David's dynasty. And life with God in the new covenant is more complex than its emphasis on fulfillment indicates. As we explore covenant life, we will see that all divine covenants follow the same basic arrangement: the threefold structure we have already seen in Ancient Near Eastern suzerain-vassal treaties. The dynamics of living in covenant with God always involved the benevolence of God, the requirement of human loyalty, and consequences for human loyalty and disloyalty. To unpack the dynamics of Old Testament covenants, we will see how these three elements appear in each Old Testament covenant. First, we will look at the universal primeval covenants. Second, we will see these dynamics in the national covenants God made with Old Testament Israel. And third, we will see how these dynamics are present in the new covenant in Christ. Let's look first at the primeval universal covenants. During the primeval history God established a covenant of foundations with Adam and a covenant of natural stability with Noah. But life under these covenants also involved a broad range of issues that may be summarized under the rubrics of divine benevolence, human loyalty, and consequences for human loyalty and disloyalty. We will look briefly at how this is true for each of the primeval covenants — first, the covenant with Adam and then the covenant with Noah. In the first place, God showed much benevolence toward the first man and woman, even before they sinned. He prepared the world for humanity, taking it from chaos to a beautiful order. And he formed a splendid paradise and placed Adam and Eve within it, giving them all kinds of privileges. These acts of kindness prepared the way for God's first covenant arrangement with the human race. You are free to eat from any tree in the garden; but you must not eat from the tree of the knowledge of good and evil (Genesis 2:16-17). Human loyalty was undeniably required in covenant life during the period of Adam's covenant. When you eat of it you will surely die (Genesis 2:17). And by implication, if Adam and Eve had passed the test, they would have been greatly blessed as they served God and spread his kingdom. So, Adam's covenant relationship with God involved consequences for loyalty and disloyalty as well. Now what was true for Adam and Eve was true for their descendants as well. Life with God continued to involve divine benevolence, human loyalty, and consequences. But Noah found favor in the eyes of the Lord (Genesis 6:8). God showed much kindness to Noah and his family. I will establish my covenant with you, and you will enter the ark… You are to bring into the ark two of all living creatures, male and female, to keep them alive with you (Genesis 6:18-19). As for you, be fruitful and increase in number; multiply on the earth and increase upon it (Genesis 9:7). The emphasis of Noah's covenant on the promise of stability in nature did not eliminate the need for Noah and those whom he represented to be loyal to God. Noah built an altar to the Lord and, taking some of all the clean animals and clean birds, he sacrificed burnt offerings on it. The Lord smelled the pleasing aroma and said in his heart: "Never again will I curse the ground because of man, even though every inclination of his heart is evil from childhood. And never again will I destroy all living creatures, as I have done" (Genesis 8:20-21). Whoever sheds the blood of man, by man shall his blood be shed (Genesis 9:6). The three dynamics of covenant life also continued through to Noah's descendants. Now, what was true for the primeval universal covenants was also true for the national covenants God made with Israel. The Abrahamic covenant emphasizing promise, the Mosaic covenant highlighting law, and the Davidic covenant accentuating the permanent dynasty of David's house, all followed the pattern of suzerain-vassal treaties. The dynamics of divine benevolence, human loyalty and consequences were present in each of these stages of divine covenants. Once again, we will look at each of these covenants in the order in which they appear: first Abraham; second, Moses; and third David. I will make you into a great nation and I will bless you; I will make your name great, and you will be a blessing (Genesis 12:2). Throughout Abraham's life God showed mercy to the patriarch, forgiving him of sin, counting him as righteous, protecting him from troubles. Leave your country, your people and your father's household and go to the land I will show you (Genesis 12:1). I am God Almighty; walk before me and be blameless. I will confirm my covenant between me and you and will greatly increase your numbers (Genesis 17:1-2). Although many Christians fail to see it, Abraham's covenant relationship with God was not entirely promissory. As with all covenants in the Old Testament, God required loyal obedience from Abraham. I am God Almighty; walk before me and be blameless (Genesis 17:1). This is my covenant with you and your descendants after you, the covenant you are to keep: Every male among you shall be circumcised… Any uncircumcised male, who has not been circumcised in the flesh, will be cut off from his people; he has broken my covenant (Genesis 17:10-14). God required circumcision as a sign of commitment to covenant loyalty, so that anyone who was not circumcised among the men of Israel would suffer the curse of being cut off from his people, excluded from the blessings of covenant life. These three covenant dynamics that appear in close association with Abraham continued to regulate the life of God's people from Abraham to the next covenant in Moses. Now the second covenant with the nation of Israel was the covenant with Moses. As we have seen, this covenant stressed God's law because it was established when God was forming the tribes of Israel into a unified nation. But it would be a terrible mistake to think that other covenant dynamics were absent from life under Moses' covenant. To illustrate the presence of all covenant dynamics in Moses' covenant, let's look briefly at the centerpiece of his covenant, the Ten Commandments. I am the Lord your God, who brought you out of Egypt, out of the land of slavery (Exodus 20:2). You shall have no other gods before me (Exodus 20:3). You shall not make for yourself an idol… You shall not bow down to them or worship them; for I, the Lord your God, am a jealous God, punishing the children for the sins of the fathers to the third and fourth generation of those who hate me, but showing love to a thousand [generations] of those who love me and keep my commandments (Exodus 20:4-6). The covenant dynamics that appear in the Ten Commandments extend to all of life from the days of Moses to the next covenant with David. The last covenant with Old Testament Israel, the covenant with David, stressed that God was establishing David's line as the permanent dynasty to rule over Israel. Yet, when we look at the larger picture, it also becomes apparent that the gift of kingship to Israel came in the context of divine benevolence, human loyalty, and consequences. You said, "I have made a covenant with my chosen one, I have sworn to David my servant, 'I will establish your line forever and make your throne firm through all generations'" (Psalm 89:3-4). If his sons forsake my law and do not follow my statutes … I will punish their sin with the rod, their iniquity with flogging (Psalm 89:30-32). If David's sons forsook God's laws, they would be punished severely. On the other hand, great blessings would come to the sons of David who were faithful to God. When we read the history of Israel from David's day until the end of the Old Testament, it is evident that these covenant dynamics continued to characterize covenant life. So it is that all three covenant dynamics appear in each covenant period of Old Testament Israel. With the dynamics of life in the universal and national covenants in mind, we are ready to turn to the new covenant, the covenant of fulfillment. For I will forgive their wickedness and remember their sins no more (Jeremiah 31:34). In this and many more ways, the new covenant clearly displays God's tender mercy. I will put my law in their minds and write it on their hearts (Jeremiah 31:33). This verse teaches that God will give his people a love for his law so that they earnestly obey him. I will be their God, and they will be my people (Jeremiah 31:33). This formula offered assurance that God would bring great blessings to his people because they would keep the obligations of this covenant. Now, we must always remember that the new covenant comes into effect in three stages, following the pattern of the final phase of God's kingdom in Christ. The new covenant was inaugurated in the first coming of Christ and in the work of his apostles. Throughout church history the new covenant continues to come to fruition in a variety of ways through the power of Christ working in the church. And the new covenant will reach its completion when Christ returns in glory at the consummation of the age. But when [Christ] had offered for all time one sacrifice for sins, he sat down at the right hand of God… because by one sacrifice he has made perfect forever those who are being made holy (Hebrews 10:12-14). [Christ] entered the Most Holy Place once for all by his own blood, having obtained eternal redemption… For this reason Christ is the mediator of a new covenant (Hebrews 9:12-15). God intervened in history to establish the new covenant by sending his son to keep every detail of God's law and to offer himself as a perfect and complete sacrifice for sin. His sacrifice brings eternal forgiveness to all who have saving faith in him. Because Jesus lives forever, he has a permanent priesthood. Therefore he is able to save completely those who come to God through him, because he always lives to intercede for them (Hebrews 7:24-25). Because he reigns and intercedes on our behalf, we can be confident that Christ will bring all who have saving faith in him through the trials and troubles that we now face. Christ was sacrificed once to take away the sins of many people; and he will appear a second time, not to bear sin, but to bring salvation to those who are waiting for him (Hebrews 9:28). When that day comes, every person who has trusted Christ will receive complete holiness and the gift of eternal life in God's eternal kingdom of the new heavens and new earth. So, we see that as we read about covenants in the Bible, we are wise to remember the distinctive emphases of each covenant period. But we must also keep in mind that there was much more to life with God than these distinctive emphases. Each stage of life in covenant with God involved the full range of covenant dynamics. Now that we have seen how life in covenant with God always entails the threefold dynamics of divine benevolence, human loyalty, and consequences, we should turn to our final topic: the people of the covenants. Who were the people of God's covenants? Who was included in and excluded from divine covenants? How did these various people relate to the dynamics of God's covenants? To answer these questions we will touch on two matters; first, we will explore the divisions of humanity; and second, we will see the application of covenant dynamics to these various divisions of humanity. Let's look first at the ways the human race is divided in relation to God's covenants. Unfortunately, we live in a day when there is much confusion about the people of the covenants. For the most part, evangelical Christians think that there are two kinds of people in the world: believers and unbelievers; saved and unsaved. Now there is nothing wrong with these categories; the Bible speaks this way many times. But problems arise because many evangelicals equate believers with those who are in covenant with God, and unbelievers with those who are outside God's covenant. In this way of thinking, there are only two kinds of people — everyone who is saved is in covenant with God, and everyone who is not saved is outside of the covenant. But when we look more carefully at the people of the divine covenants, it soon becomes apparent that this twofold division does not adequately describe the human race. To unpack a more adequate way of thinking about the divisions of humanity, we will look at two issues: first, the division of people within divine covenants; and second, the division between those who are included and those who are excluded from divine covenants. In the first place, it is important to see that an important division of people appears within every covenant in the Bible. Every covenant of the Old Testament included both believers and unbelievers. This is not difficult to see with the covenants with Adam and Noah. They are called universal covenants precisely because all people, whether believers or unbelievers, are bound to God by these covenants. The foundational principles established in Adam's covenant apply to those who have saving faith and those who do not. The promise of stability in nature in the covenant with Noah applies both to believers and unbelievers. So during the primeval history, there were two kinds of people in the world: true believers who were in covenant with God and unbelievers who were also in covenant with God. Now, a similar situation held for the national covenants with Abraham, Moses and David. Each of these covenants also included both believers and unbelievers. As the Old Testament makes clear, throughout the centuries, the majority of Israelites proved to be unbelievers, even though they were in covenant with God. Within the entire nation as God's covenant people, only some truly believed and were eternally saved from their sins. So, the covenants of national Israel included both believers and unbelievers. In this way, the people of the national covenants with Israel looked very much like the people of the universal covenants with Adam and Noah. "No longer will a man teach his neighbor, or a man his brother, saying, 'Know the Lord,' because they will all know me, from the least of them to the greatest," declares the Lord. "For I will forgive their wickedness and remember their sins no more" (Jeremiah 31:34). The hope of the new covenant was that the people of God would be fully redeemed from sin, each one knowing the Lord without exception. But while this is the destiny of the new covenant, we must remember once again that the kingdom of God in the new covenant is fulfilled in three phases. It was inaugurated in Christ's first coming, it continues today in the church, and it will reach its consummation when Christ returns in glory. In other words, the hopes of the new covenant did not come about suddenly or completely when Christ first came to earth. As a result, until Christ returns to bring full salvation, there are both believers and unbelievers in the new covenant. On the one hand, the people of the new covenant include men and women who have exercised saving faith in Christ. Whether Jews of Gentiles, they are true believers purchased by Christ's blood and eternally justified by faith. On the other hand, people of the new covenant also include Jews and Gentiles who are not true believers but who have experienced a measure of the blessings of the new covenant, even though they have no saving faith. They went out from us, but they did not really belong to us. For if they had belonged to us, they would have remained with us; but their going showed that none of them belonged to us (1 John 2:19). Here the apostle wrote about people who leave the Christian faith. He said in one sense they were "of us"; that is, they were part of the Christian church. But he says also that by leaving the faith, they made it clear that they did "not really belong to us"; that is, they were not true believers. And how did he know this? As he said, if they had really been of us, they would have remained with us. That is, they would have remained faithful to the end. We all know that the rosters of churches include people who are saved from their sins and people who are not. No one claims that everyone counted among the people of the new covenant is truly saved. Even though we cannot always distinguish between them, the New Testament clearly teaches that until Christ returns, the church, the new covenant community, consists of both true believers and unbelievers. In the second place, we must also recognize an important division among human beings between those who are included and those who are excluded from certain covenants. Now we understand that every person is included in the universal covenants with Adam and Noah; no one is excluded from the foundations and natural stability established in these covenants. But the situation for humanity changed once God chose Israel as his special people. At that time you were separate from Christ, excluded from citizenship in Israel and foreigners to the covenants of the promise, without hope and without God in the world (Ephesians 2:12). People outside the national covenants with Israel were without God and without hope. So, by the time we come to the national covenants, there are actually three kinds of people in the world: those who were in Israel's covenants with God as true believers; those who were in Israel's covenants with God as unbelievers; and those who were outside Israel's covenant. The same threefold situation holds for the new covenant as well. As we have also seen, until Christ returns in glory, the new covenant has both believers and unbelievers within it. But in addition to these two kinds of people in the new covenant, we must add a third category: men and women who reject the gospel; those who do not claim to be Christian; those who are not part of the church. They are excluded from the new covenant. While during the Old Testament period of national Israel those outside of covenant were primarily Gentiles, now that Christ has come, those outside of the new covenant include both Jews and Gentiles who have no part in Christ or his church. So we see that the Scriptures divide the human race in various ways in relation to divine covenants. The universal covenants include all people, both believers and unbelievers. The national covenants excluded the vast majority of Gentiles, but also included both believers and unbelievers within Israel. And until Christ returns in glory and purifies his church, the new covenant excludes Jews and Gentiles who have no part in the Christian faith, but also includes both Jews and Gentiles who are believers and unbelievers. Now that we have seen how humanity is divided into various groups as they relate to God's covenants, we are ready to turn to another issue: How are the dynamics of covenants — divine benevolence, human loyalty, and consequences of loyalty and disloyalty — applied to these various groups? As we read the Old Testament seeking to understand its original meaning and how to apply it to our day, it is important to remember that both Old Testament Israelites who first read the Old Testament and we Christians who read it now face a similar threefold division of the human race: those outside covenant; unbelievers in covenant; and believers in covenant. This means that if we hope to understand how the dynamics of covenant applied to people living in the days of the Old Testament and then relate those dimensions of original meaning to our own day, we must always think in terms of these three kinds of people. First, we must consider unbelievers excluded from the national covenants with Israel and unbelievers excluded from the new covenant. Second, we must consider unbelievers who are included in the national covenants with Israel and unbelievers who are included in the new covenant. And third, we must consider true believers included in the national covenants with Israel and true believers within the new covenant. Let's look first at how covenant dynamics apply to unbelievers who were excluded from the covenants with Israel and the new covenant. Your Father in heaven… causes his sun to rise on the evil and the good, and sends rain on the righteous and the unrighteous (Matthew 5:45). We often call these blessings "common grace" because they are not saving mercies, but grace shown to all human beings. Since the creation of the world God's invisible qualities — his eternal power and divine nature — have been clearly seen, being understood from what has been made, so that men are without excuse (Romans 1:20). So, even unbelievers outside the covenants with Israel and the new covenant have a basic obligation to worship and serve their creator. In the third place, unbelievers outside the national covenants and the new covenant experience consequences for their actions. At times, God grants temporary blessings to unbelievers when they live according to the truth. Even among such unbelievers, wise living has benefits. And at other times God responds to their flagrant rebellion with temporary curses. Despite these mixed experiences for those outside of covenant, when Christ returns, these unbelievers will have no blessings from God. They will only suffer his eternal judgment. In these ways, unbelievers outside of Israel's national covenants and unbelievers excluded from the new covenant today experience the dynamics of the universal covenants. Theirs is the adoption as sons; theirs the divine glory, the covenants, the receiving of the law, the temple worship and the promises (Romans 9:4). God shows greater mercy to unbelievers who are in the covenants with Israel and in the new covenant that he does to unbelievers outside of these covenants. In the Old Testament, unbelieving Jews were delivered from Egypt. They received God's gracious law at Sinai. They conquered the Land of Promise. They were blessed by the reigns of David and his sons. In the same way, unbelievers in the New Testament church are ministered to by true believers; they hear the preaching of the word; they share in the work of the Spirit. In these and other ways, unbelievers in the special covenant community have been shown great kindness from God. From everyone who has been given much, much will be demanded (Luke 12:48). Those who hear the truth of God's Word, those who know his ways, are held responsible to be loyal to him. In the third place, unbelievers in the national covenants and in the new covenant also experience consequences for their loyalty and disloyalty. On the one hand, they experience heightened blessings and cursings in this life, many different kinds of temporary blessings and curses. But on the other hand, when Christ returns, unbelievers in covenant with God have just one expectation: eternal curse, eternal judgment. Because they have not trusted in the promises of God in Christ, they remain lost in sin and destined to eternal punishment. Anyone who rejected the law of Moses died without mercy … How much more severely do you think a man deserves to be punished who has trampled the Son of God under foot, who has treated as an unholy thing the blood of the covenant that sanctified him, and who has insulted the Spirit of grace? (Hebrews 10:28-29). Notice here that these people are "sanctified" by "the blood of the covenant." This does not mean that they were saved, but only that they were set apart to God, that they were in covenant with him. And when these people rebel against God, as they always do to some degree or another, there is only one expectation, namely, the eternal judgment of God, the judgment he has reserved for his enemies. And this judgment is all the more severe because the mercy shown to them was so great. So, we see that for unbelievers in the national covenants and the new covenant, the dynamics of divine benevolence, human loyalty and consequences are heightened. But in the final analysis, if they do not repent and exercise saving faith, these unbelievers will still suffer eternal judgment from God. Therefore, there is now no condemnation for those who are in Christ Jesus, because through Christ Jesus the law of the Spirit of life set me free from the law of sin and death (Romans 8:1-2). The sinful mind is hostile to God. It does not submit to God's law (Romans 8:7). Therefore, brothers, we have an obligation… [to] put to death the misdeeds of the body (Romans 8:12-13). In other words, believers have an obligation to live differently from unbelievers; that is, they have an obligation to submit to God's law, not to earn salvation, but to honor God. Remember how the Lord your God led you all the way in the desert these forty years, to humble you and to test you in order to know what was in your heart, whether or not you would keep his commands (Deuteronomy 8:2). Examine yourselves to see whether you are in the faith; test yourselves. Do you not realize that Christ Jesus is in you — unless, of course, you fail the test? (2 Corinthians 13:5). Work out your salvation with fear and trembling (Philippians 2:12). The Lord disciplines those he loves, and he punishes everyone he accepts as a son (Hebrews 12:6). He who overcomes will inherit all this, and I will be his God and he will be my son (Revelation 21:7). As we continue to study the Old Testament in this series, it is essential that we always remember these three divisions of humanity and how covenant dynamics apply to them. When we remember the distinctions between unbelievers outside of the national covenants and the new covenant, unbelievers within these covenants, and true believers within these covenants, we will be equipped to understand what implications the Old Testament had for the ancient Israelites who first read it, and we will be better equipped to see how it applies to us today. Every passage in the Old Testament warned and encouraged its original readers to consider their status in relation to God's covenants, and we must do the same today. At every point, the Old Testament called unbelievers outside of Israel's covenants to submit themselves to God and to enter into his covenants or suffer God's eternal judgment. The Old Testament calls on those outside the new covenant to do the same today. The Old Testament first called unbelievers in Israel's national covenants, and now calls unbelievers in the new covenant to exercise saving faith in the promises of God in Christ or face severe eternal judgment for violating their covenant relationship with God. And the Old Testament once called true believers in Old Testament Israel, and now calls true believers in the new covenant to remember the mercy God has shown them, to demonstrate their faith by living faithfully before God, and to continue to hope in eternal life in the new heavens and new earth that God will bring at the consummation of his kingdom. When we remember how covenant dynamics apply to every kind of person living today, we can see how we should apply the Old Testament to our own lives and to the lives of others around us. As we read the Old Testament today, we are to ask how each passage calls for unbelievers outside of the covenant to enter into the new covenant, and we are to ask how each passage calls for unbelievers in the new covenant to move forward toward saving faith in Christ, and we are ask how each passage calls true believers in the new covenant to ever increasing faith and grateful faithfulness to the new covenant in Christ. In this lesson we have introduced the biblical teaching of divine covenants. We have seen that God administrates his kingdom through covenant arrangements. We have seen how each covenant in the Old Testament stressed particular things that the kingdom required at different stages of its history. We have explored the basic dynamics of a covenant relationship with God, and we have seen how these dynamics apply to different kinds of people living in the past and today. As we move forward in this survey of the Old Testament, we will return to the theme of divine covenants time and again. Covenants formed the structures of the life of faith for Israel in the Old Testament, and they also form the structures of the life of faith even today. Dr. Richard L. Pratt, Jr. (Host) is Co-Founder and President of Third Millennium Ministries. He served as Professor of Old Testament at Reformed Theological Seminary for more than 20 years and was chair of the Old Testament department. An ordained minister, Dr. Pratt travels extensively to evangelize and teach. He studied at Westminster Theological Seminary, received his M.Div. from Union Theological Seminary, and earned his Th.D. in Old Testament Studies from Harvard University. Dr. Pratt is the general editor of the NIV Spirit of the Reformation Study Bible and a translator for the New Living Translation. He has also authored numerous articles and books, including Pray with Your Eyes Open, Every Thought Captive, Designed for Dignity, He Gave Us Stories, Commentary on 1 & 2 Chronicles and Commentary on 1 & 2 Corinthians. Copyright 2011-2019, Third Millennium Ministries. All rights reserved.